Thought I'd make an Easel Card. 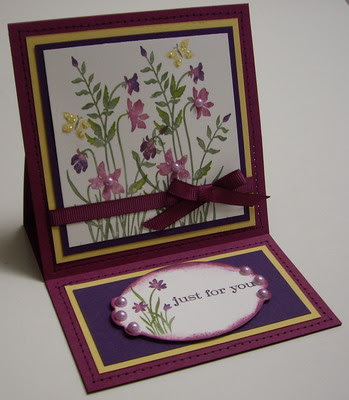 (See http://www.splitcoaststampers.com/resources/tutorials/easelcard/ for tutorial). It was so easy and I just love the look of it. It makes it seem like your card is on display - a work of art (which, of course, it really is!). Hope you like. Accessories & Tools: Paper Piercing Tool and guide, Spellbinders Nestabilities - Label Ten), 1/4" Rich Razzleberry grosgrain ribbon (approx. 14", divided), nine mauve half-pearls, stickles, sticky strips, adhesives and dimensionals. Using the Stampin' Write markers, I inked the main stamp in the Just Believe set and stamped it onto the Whisper White cardstock on the left hand side. I re-inked the stamp again and stamped it on the right hand side. I inked the butterfly from the Sweet Summer stamp set and stamped it twice. Using the So Saffron marker, I filled in the wings of the butterflies. I filled in the bodies of the butterflies with Sahara Sand ink. I mounted the stamped image onto the square piece of Elegant Eggplant cardstock and then mounted it onto the square piece of So Saffron cardstock. Using sticky strips, I attached a piece of ribbon about 3/4" up from the bottom and glued it to the back. I paper pierced all around the border of the 4 1/4" square piece of Rich Razzleberry and then used my Elegant Eggplant Stampin' Write marker to add "stitch" lines. I then mounted the framed, stamped image onto the Rich Razzleberry square and adhered it to the base of the easel card. I repeated the same process for the sentiment, but this time I used the small Label Ten Nestabilities to cut out the Whisper White cardstock. I sponged the edge with Rich Razzleberry ink. I mounted it to the center of the other frames and popped it up with dimensionals. To finish, I used stickles to highlight the wings of the butterflies. I added a bow on top of the ribbon, and mauve half-pearls to the centers of three of the flowers and also the edges of the sentiment label.